The marina plan includes riverside accommodation, moorings for narrowboats and cruisers and a possible hotel. Plans for a new £33m marina at Wellingborough's embankment have been drawn up and can be shown for the first time. Riverside accommodation, 48 hour moorings for narrowboats and cruisers, a new hotel and river taxis linking the town to nearby Rushden Lakes are all part of the high-level concept which has been put together by a consortium that includes the town’s chamber of commerce, the town centre partnership and the River Nene Regional Park CIC. The area marked B is where the proposed marina would be sited if permission is granted. A feasibility study for the scheme has been drawn up after Wellingborough Council awarded the Nene Valley Catchment Partnership a £15,000 grant last year to look at potential projects for the waterside area. After looking at the possibilities a scheme that would transform the town’s embankment area has been devised. Simon Toseland, who is president of the Wellingborough Chamber of Commerce, has been heavily involved in the proposal and will be going out to investors to try to bring in funding to help make the development happen. The land is owned by Whitworths, Bovis Homes and Wellingborough School. The proposal is on an area of local open space which is currently used as playing fields. The land is part owned by Whitworths, Wellingborough School and Bovis Homes. The scheme is at the early stages and a planning application has not been submitted. It is estimated it would take between five to 10 years to come to fruition if granted planning permission. The authority’s planning officers have however highlighted a number of drawbacks to the scheme including flood risk issues, the loss of open space and vehicle access to the site. 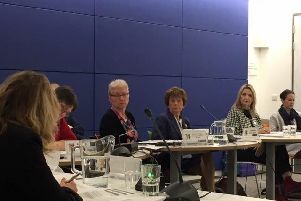 A council spokesman said: “The Nene Valley Catchment Partnership formed a working group focused on the Wellingborough Waterside to identify projects to improve the commercial, recreational, aesthetic and environmental status of this area. “The council awarded £15,000 to the River Nene Regional Park as the overarching body for the Nene Valley Catchment Partnership. “This was a contribution towards a wider project aim to develop an outline plan for the Wellingborough waterside, community engagement and to cover the costs of relevant surveys and searches. “The funding was allocated from the council’s allotted funds for projects benefiting the voluntary, community and not-for-profit sector. “The council is aware of proposals to develop and enhance the embankment area and is generally supportive of these proposals, however there are a number of external agencies such as the Environment Agency and Natural England whose input into these proposals will determine their acceptability. Mr Toseland has been advised to contact these external agencies as the next stage in the development process.